This year's National Wildwater Championships and Western Junior Team Trials were held in conjuction with FIBArk for the second year in a row, but this year, there were a few unexpected results, due to the fact that our senior team is currently in the Czech Republic for the World Championships, and a globe-trot to Colorado is not the best thing to do in the middle of Worlds. Early in the week, Rodney Rice, Lincoln Williams, Casey Jones, and myself arrived from the east coast to meet Doug Ritchie and learn the course on the Arkansas with him. The river was running nearly 3,000 cfs - a big and fluffy course that could be really challenging at times in a Wildwater boat. Sadly, all the mid-elevation snow melted and as the week went on, the river steadily dropped to around 1,400 cfs, where it hovered for our races, leaving us with some decent rapids and some long pools to race through. Friday afternoon, our sprint runs were through Cottonwood Rapid. The two holes and multiple reactionary waves coming from river left made this rapid very tough to run fast and cleanly. The consensus among some of the more experienced racers was that you could hold the World Championships on that rapid because of its challenging nature and carnage potential (the force of the water folded a racer's boat during practice earlier in the week ). There were several sweeeeeeeet and fast lines, but carnage and bad lines abounded, resulting in several swims and one injury to a member of the Irish Canoe Team that warranted taking him to the hospital for x-rays. Winning times were in the vicinity of 1:30 seconds. Saturday afternoon, the classic race, started in downtown Salida in the slalom course just before the first rodeo hole. Again, there were several fast lines and several not-so-fast lines, with some competitors eddying out on river left trying to stay on the fast line through the hole. Personally, I did not see the classic race, as I was racing myself. After a grueling pain session lasting just above a quarter of an hour, racers flew by the finish line at the bottom of Bear Creek Rapid. Winning times in the Seniors were 21:14, in the Juniors, 22:44. The 2006 USA Wildwater Junior Team has now been selected, featuring the six best K-1M racers, the six best K-1W racers, and a C-2 team. We are still lacking several C-1 racers and a C-2 team to be able to field a 'complete' team. That's ok, since we still have until next summer to keep building. 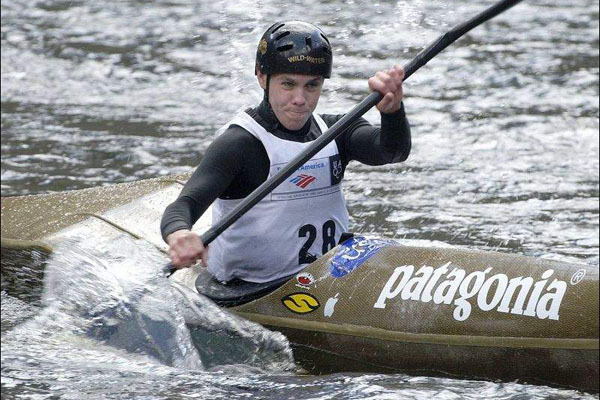 Congratulations to the new Junior team members and the 2006 USA Wildwater National Champs! Check out the photos at www.usawildwater.com/photos/nationals_2006.html. More information about FIBArk can be found at www.themountainmail.com/.